Our readers say it best: "great ideas for on the go breakfast and lunch. Easy to follow, simple recipes, with ingredients you probably have". 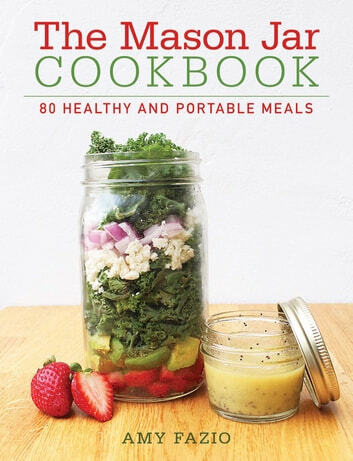 "If you are struggling, as I was, to get more fruits and veggies into your diet, this makes it so simple"
Amy Fazio’s second book, The Mason Jar Cookbook, shows the versatility and convenience of creating dishes in the mason jar. No longer just for jellies and jam, mason jars are now being filled in the most creative and often super healthy ways, such as salads and casseroles. The easy-to-follow recipes in this book will show you how to prepare breakfast, lunch and dinner in a mason jar. Oh, and dessert! Can’t forget dessert. The Mason Jar Cookbook will feature, in beautiful full-color photos, over 100 ways to create, carry, and consume food in the mason jar. Many of the recipes will include tips on serving and storage. Several will also include notes on substituting ingredients to include seasonal fruits and vegetables. Beautiful, convenient, easy, versatile and just plain cool. Just some of the many reasons why everyone should have mason jars in their life.